BYU currently stands at 4-4, having played two-thirds of their 2012 schedule. Much has been written and said about their inability to win the “big” games on their schedule. BYU has lost to three current top 25 teams, @ Notre Dame (5th), Oregon State (7th) and @ Boise State (21st). These three teams are a combined 19-1. The other loss was @ Utah (2-5). Their wins have come against an FCS school Weber State, two losing teams Hawaii (1-5), Washington State (2-5), and one winning team Utah State (6-2). BYU is 1-0 vs FCS teams and 3-4 vs FBS teams. They are 1-3 vs AQ teams and 3-1 vs non AQ teams. They are 0-3 vs top 25 teams and 4-1 vs non top 25 teams. They are 1-3 vs winning teams and 3-1 vs losing teams. They are 4-1 at home, and 0-3 on the road. They are 2-1 vs instate teams. What can we expect for the remainder of 2012? Looking at the first eight games we know that BYU does really well vs losing teams, especially at home. They struggle on the road especially against winning, top 25, AQ teams. Luckily for BYU the schedules lighten up with no top 25 teams, only one winning team, and only one AQ team. They will be heavy favorites vs Idaho (1-7) and @ New Mexico State (1-6). They are likely to be favored @ San Jose State (5-2). They are a slim underdog traveling to Georgia Tech. The best guess is that they finish 3-1 in the last four and 7-5 overall. The biggest challenge of scheduling as an independent is balance. In 2012 the balance between tough games and easy games has been good. There are easy wins vs Weber State, Hawaii, Idaho, and New Mexico State. There are tough games vs Utah, Boise State, Oregon State, Notre Dame, and Georgia Tech. The trouble with the 2012 schedule is when and where the tough games are played. BYU played @ Utah on September 15th and @ Boise State on September 20th, only 5 days later. In October BYU played vs Utah State and Oregon State, then @ Notre Dame and Georgia Tech. They started the season with easier games vs Washington State and Weber State. And the close the season with Idaho, San Jose State, and New Mexico State, they also fit Hawaii in between Boise State and Utah State. The schedule would be more winnable if they could space out their tougher opponents. 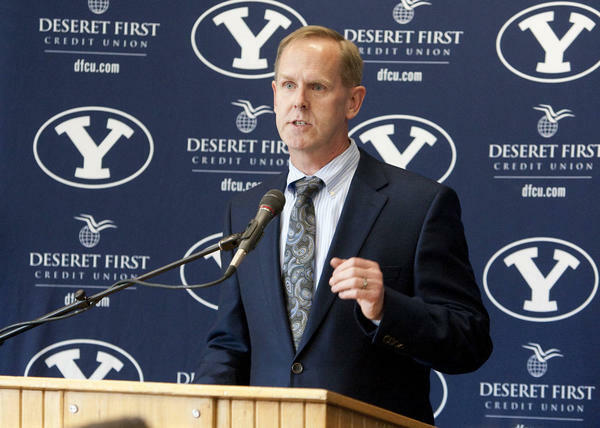 As an Independent BYU has to adopt the attitude that we will play anyone, anytime, anywhere. Even if it creates imbalance in the schedule, like playing top 10 teams in consecutive weeks or playing four of your toughest 5 opponents on the road. These are things that the BYU football program will have to get used to as an independent. Ideally BYU would be able to play their toughest opponents equally on the road and at home, and ideally they would be able to spread them out throughout the season. If I were Tom Holmoe I would do this as much as possible, but I understand that may just be a pipe dream. In 2012 for example I would have swapped the Boise State and Hawaii games, the Oregon State and Idaho games and the Notre Dame and New Mexico State games (if possible). This would have broken up the biggest games and November more watchable. The 2013 schedule has a number of big names and tough games. They have 15 weeks to play 12 or 13 games ( Hawaii exception). They have 11 games slated some with dates others without. They have some good November games, but they are both on the road at Wisconsin and Notre Dame. They host Texas and Boise State in September and Georgia Tech in October. They have contracts without specific dates with Utah and Middle Tennessee (home) and Washington State (away). They close the season @ Hawaii on the first Saturday in December. Here is a mock 2013 schedule. Playing big games in consecutive weeks is something I suggest avoiding when possible. I would use the first bye week after a brutal September stretch. And I would use the second the week before Wisconsin. Using the bye weeks in those places creates a three part season and it gives you rest after or before big stretches. I am big proponent of scheduling the 13th game each year you play @ Hawaii. History has shown that a 10 win BYU team is in the top 25 every time. Regardless of how many losses they have. So an extra game gives you a greater possibility for a national ranking. In 2013 10 wins would be a very big accomplishment. BYU will be looking to break their trends vs teams with winning records, top 25 teams, and AQ teams. Their ability to do so may rest largely on their ability to create balance within their schedule. Creating balance may require more scrutiny on who you play and when and where you play them. In being more selective BYU might miss out on some big games, but it may allow them more wins, success and recognition. The other ways of getting more wins in those “big” games will be to lower the amount of turnovers and get more consistent quarterback play. With the outcomes still in doubt it will definitely be exciting to see BYU play a bigger better schedule, and just one of these days they will break through and win a “big” game or two. BYU hasn’t avoided top-notch opponents lately, and that deserves a lot of respect from the college football world.